Sometimes I do really stupid things when I’m tired. Ridiculously stupid. But the stupidity payed off recently. The fabulous Sommer Marsden was having a blog competition about exhaustion induced stupidity and thanks to the draw I won a copy of I is for Indecent! The book came in the mail yesterday and now I have a lovely new anthology to read – thanks Sommer!!! What did I do? Well, when my second son was around seven or eight months old and still waking up every two hours every night I was constantly exhausted. In the shower one morning, instead of working conditioner through my hair with a pick, I used my razor instead. After I ended up with a hand full of hair, I woke up really quick and was forced to wear strategically placed barrettes for quite a while. Sad, but true. Oh well – it grew back and now I have a nifty new book. Yay me. Besides I is for Indecent, I’m also reading The Light-Bearers Daughter by O.R. 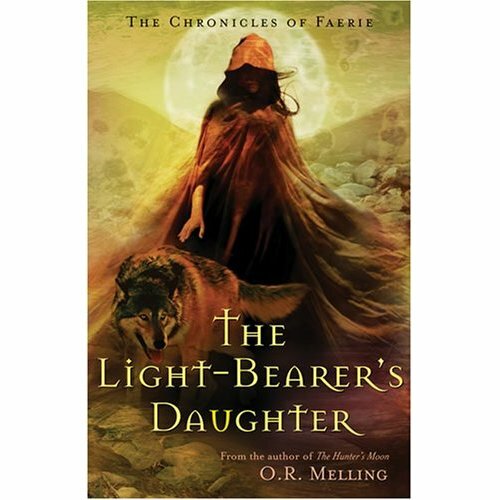 Melling – an excellent YA book and the third in The Chronicles of Faerie. I love this series. So what’s everybody else reading? Got anything you’d recommend? I am reading a light fantasy by Jim C. Hines called Goblin Quest. It’s a traditional quest story, except from the point of view of a goblin who accidentally gets hooked up with some adventurers. Fun stuff. I just finished reading Honeysuckle, which you’ve probably already read!In print, I’m recommending Jamie Carie’s Snow Angel! Wonderful book set in late 1800’s Alaska and shows how dangerous the gold fever and the quest for it was, especially in the harsh climate of the Yukon Territory. LMAO at the thought of shaving part of your own head like a kid giving yourself a haircut! I once sailed across a five lane highway (red light!) in a tiny Ford Fiesta, just missing three tractor-trailers and realized it two lights later when I sort of woke up… mostly because my house hunk was yelling at the top of his lungs. Um, lesson? Don’t drive when you’re that tired.Reading? I have to pick one? Nope, can’t do it. The next two books I’m reading are To Love a Hero and Overload’s Vessel then American Beauty.Gee, Me. I don’t think I’ve ever been that tired. I have Silverhills on the ready too. So many books, so little time. Oh and Perilous Passions, the Mating Stone. Aw heck. I need to get with it already. I’m postitive I will. There is not a BG book I haven’t loved and I’ve read the excerpts for this one. Oh my. It’s hilarious after the fact. You didn’t hurt yourself, right?That sort of reminds me of what my best friend told me one day. She called me (she worked in the office down the hall and at the time, my oldest son was staying with her for a couple months – we were moving from a rental to our own house but in the interim in a motel with very small space so Luke stayed with Jo and her son DJ). So Jo says, “I have good news and I have bad news. I’ll give you the bad news first. The boys gave each other a hair cut. They’re both bald. The good news is that the hair will grow back.”That was before bald was the fad. My son looked horrible bald. It made him look scrawny and normally he has such beautiful blonde, silky hair. She was right, it grew back. Too good. Now it’s down past his shoulders and he sometimes wears it in those Chinese top knots or pig tails – just at home – but it’s funnier than when he was bald.